The allure of living in something tiny—like, say, a shoe—has long held romantic sway in our imaginations. Who doesn't love the aesthetic preciousness of doll-houses or, for that matter, those amazing space-maximizing, nook-and-cranny-exploiting rooms at IKEA? A year ago, Gusty and Jason decided that they wanted to downsize their possessions and take to the road. After some Craigslist sleuthing, the couple found a woman in Mississippi looking to sell her 8-by-17-foot tiny house. They paid $16,000 and towed it across the country, landing at Green Valley Village in Sebastopol, where it cost them $300 a month to park. But being cooped up through the rainy season drove them into a roomier house on the property. The tiny house—now for rent—sits empty near the woods, like a quaint relic out of a fairy tale. 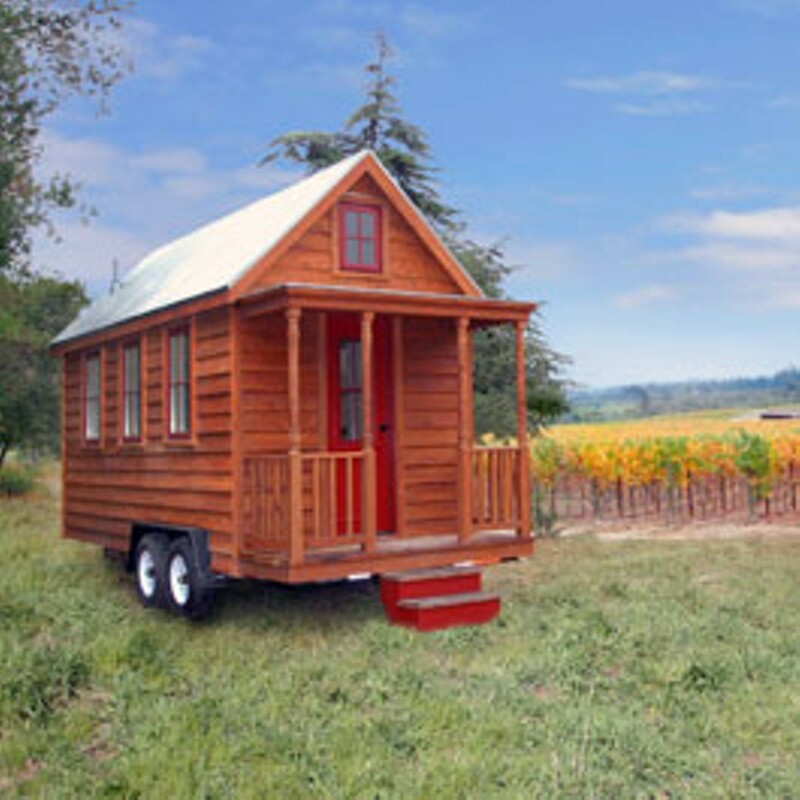 The mastermind behind its design is Jay Shafer, the creator of Tumbleweed Tiny House Company, which sells 24 different floor plans for houses ranging from 65 to 837 square feet. 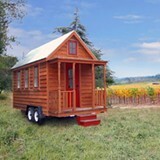 For those reluctant to build their own, Tumbleweed also sells readymade tiny houses for an average of $35,000. Shafer built his first tiny house (110 square feet) in Iowa in 1999, and lived in it for five years before moving out to Sonoma County, where he built himself another, even tinier house—70 square feet, smaller than many people's bathrooms. A self-described "claustrophile," Shafer is one of the few people who's actually benefited from the economic downturn: as money gets tighter, so do people's living spaces. His self-published tome, The Small House Book, has seen a sharp rise in sales, and his company currently sells about 10 sets of tiny house plans a month. "We're essentially selling a dream," Shafer explains. Three years ago, after getting married and having a son, Shafer moved his family into a 500 square-foot house in Graton. His tiny house remains on the property, a cozy office space with a sleeping loft in case one of the parents needs a night's respite from the baby. "My definition of small is one in which all the space is being used well," Shafer tells me on a recent morning, as we sit on two plush chairs in the cathedral-ceilinged great room of his tiny house. "I deliberately made the doorway small," he explains, "to create the feeling of space after you walk through it." Indeed, everything is artfully, brilliantly deliberate, from the vertical stainless steel bathtub (designed by cask-makers in Healdsburg) to the secret double-door closet where Shafer hangs his neat penciled blueprints. As a kid living in a 4,000-square-foot trophy house in Iowa, Shafer actually envied the kids who lived in smaller, cozier homes; they didn't have to spend hours vacuuming pastures of unused space. After studying painting in college, he called a number of small spaces home: a dome made of pine, an uninsulated 1964 Airstream and sometimes, for the night, the backseat of a car. Inspired by "religious architecture and vernacular common sense," Shafer began designing tiny houses for fun—until he discovered that they violated state building and zoning codes. "Once I found out that living in a tiny house was actually illegal in the United States," he tells me, "then I had to do it." It took him nearly a year to free himself of unnecessary accumulations. "I took pictures of everything," he says, and then, too impatient to even sell his paintings, "I took them to the dump and watched them get buried by a tractor." Shafer believes that disentangling from "the secular idolatry" of things can make people happier. "Getting to know oneself," he explains, "is largely a subtractive process." People, apparently, are hungry for less. In fact, so big has the tiny-house movement gotten that Shafer, who was recently profiled in the New Yorker, built a fence to protect his family's privacy. His architecture, however, has proved harder to protect: people plagiarize his designs and brag about their accomplishments on the internet. "So," Shafer says with characteristic nonchalance, "we contact them and ask for our money." He's given workshops all over the nation, and his "Fencl" design recently became spotlighted, thanks to Santa Rosa High School junior Austin Hay, who's building his own tiny house, an enviable (and ecological) option to dorm-living when he goes off to college. Thanks to all the press coverage, the county building department has been inundated with calls from interested parties. But, as Shafer points out, mandates are handed down from the state, the nation and even the International Code Council, which usually dictate that the smallest a "legal" house can be is about 261 square feet. Still, the key to loophole heaven is quite simple: put it on wheels. Despite his Zen-like calm, Shafer is enraged over the paradox that banks will deny people loans for tiny (read: affordable) houses, but are happy to sell them too-big homes that become "debtor's prisons." Creating tiny houses is at once his passion and his rebellion. "It's a form of civil disobedience," he says, "a way to creatively vent my anger."